Everyone knows that this is ‘the biggie’. Everyone knows it’s the longest day, the most ascent etc, even if its not true. This is the day you have to get through, when your knees may go, or your Achilles or whatever. For us it’s a day to go off route. Wainwright said you should make your own Coast to Coast, and not slavishly follow the proscribed path. Well today is it. It is quite a good feeling, thinking that our decisions are our own, for a short distance at least. Amazingly, it is again a lovely day, and all my alternative bad weather plans for buses at two o’clock to Penrith, or a boat up the lake to Pooley Bridge, are surplus to requirement. Great. Good breakfast. Pictures of the landlady’s young son completing the Patterdale Round adorn the wall. 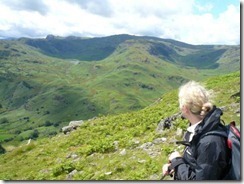 (‘An interesting and varied day of hiking and scrambling with some fantastic views. 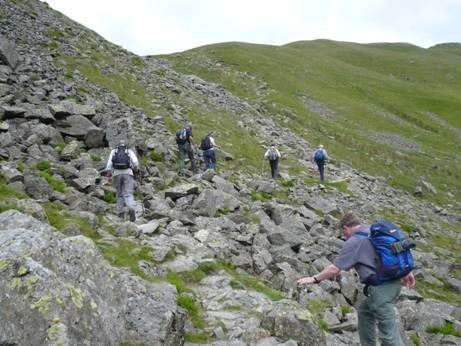 The route starts from Patterdale and takes in Helvellyn via Swirral Edge or Striding Edge, Nethermost Pike, Dollywaggon Pike, Grisedale Tarn,Fairfield, Cofa Pike, St Sunday Crag and Birks.The route is approximately 16.5Km and involves 1,450m of ascent.’) They breed them tough around here it seems. He looks to be about 12. 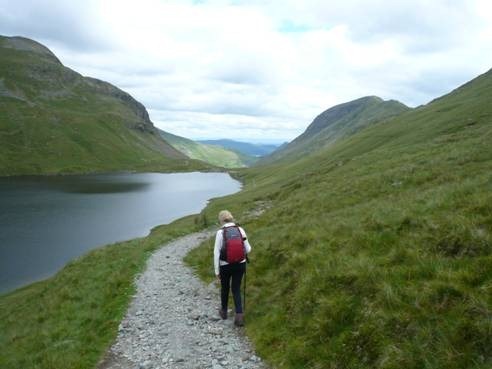 As we boot up we tell her of our intension not to go back to Patterdale and ascend to Kidsty Pike via Angle Tarn as per THE BOOK. We have been down that route before, and there doesn’t seem to be much purpose to going back an extra mile plus to Patterdale. 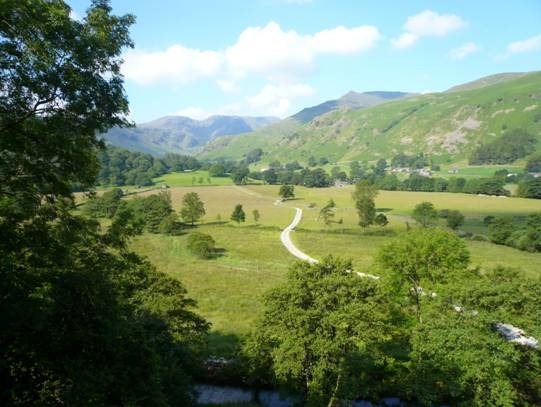 We plan to walk up the valley to Hartsop, go up to Haweswater, and ascend steeply to join the main route at The Knott. She thinks that is a good plan, and reckons it might save about 3 miles for us. Then she recommends another detour. The way down from Kidsty Pike is notoriously steep. Even THE BOOK calls it “gnarly”. 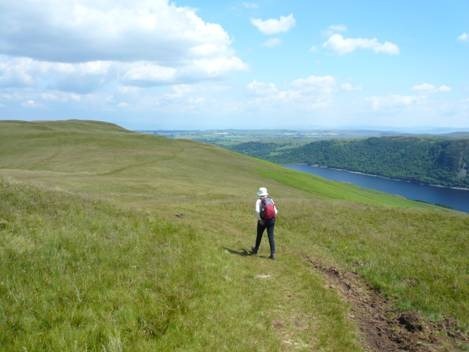 Why not walk up the Roman Road (High Street) back towards Pooley Bridge, over High Raise, then turn off towards Bampton Common and down to Haweswater that way? This sounds like an OK sort of a plan. Maybe. We set off into a gloriously beautiful morning. There’s something special about the light in the valley. Everything is suffused with a glowing dewy newness. Its like the morning of life. I am definitely coming over all poetic. The path is good. Hartsop is lovely. The path up to Haweswater is steeper than we thought, but still fine. At Hawewater, the lake is all but deserted. This is such a great way to come. 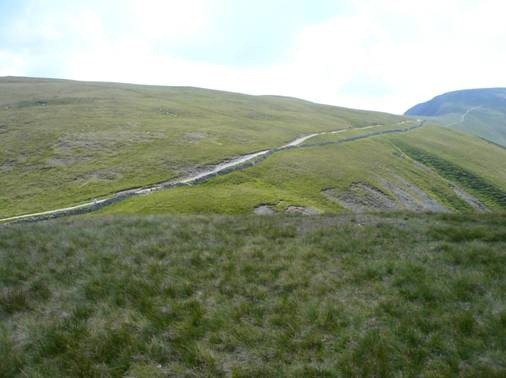 Our path up to The Knott is chest splittingly steep, but not long, and we are soon joining the main highway past the Straits of Riggindale and turning left for Kidsty Pike. 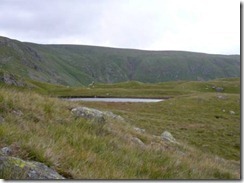 “Kidsty Pike… One of the finest views in all Lakeland”, intones my Wainwright impersonating companion. It has been such a great morning, and it’s a real teehee to be turning off down High Street and avoiding Kidsty Howes. Along High Street all is sweetness and light. We know the path, and its easy but boggy. 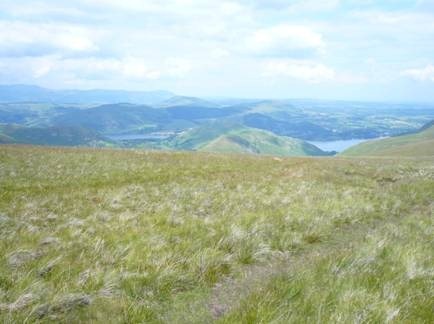 We can see Ullswater below from the top of High Raise. Its even getting warm. I’m glad we made an early start. So on we go. And on. And then along. But unfortunately we have not spotted the turn off to Bampton Common. We didn’t ask the landlady for much detail. as we have our map. 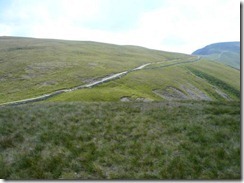 The path seems obvious on it, opposite the path up from Fusedale…. We never did find that path. The cotton grass is long up here in its summer profusion. God knows where it was. Ray decides that we must cut across country, ie bog, in the correct sort of direction. This is incomprehensible to me. How can you walk where there isn’t a path? Over bog?? Should we contour down to the Lake or continue along the path? Ray plumps for the path, and although this was not necessarily the worst choice it does take us an eternity to come off of the common; past a farm, through several areas of waist high bracken past free animals, over a stream. All in full on sun. No shade to be seen. We also have several anxious moments when we seemed to be getting further away from where we should be, before we finally emerge onto a road at Burnbanks, the village at the end of Haweswater. The Coast to Coast sign is a few yards away. That was quite an adventure!! And still quite a way to go. This third part of the day takes us along a shady stream and over farmland, and by the time Shap Abbey comes into view we really are rather tired. We still have to get to Shap though. THE BOOK tells us its only 20 minutes more. Ray is behind me, which is odd, and I realise without thinking about it, that he is exhausted. 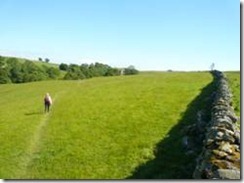 So we proceed along the road to Shap singing loudly… anything that comes to mind… anything to stop thinking about walking. Lucky lucky. Our B&B is one of the first we encounter in the village, but priorites are Beer, Beer and Beer. Just after the B&B is The Bulls Head. Its definitely not Lakeland. The garden is a trifle shabby. But the pint of shandy we both have disappears like water poured onto sand. Better go on to our lodgings then. The Hermitage is imposing, and the landlady welcoming. Goodness only knows how we get those brick lined suitcases up the creaky stairs. Our room is tilting wildly to one side. It is a very old house, but our room has… yes, it really does have… a bath!!! Sometime about now Ray starts shivering and feeling bad. We realise in due course that he must have sun stroke. He has first bath,takes Paracetamol and Ibuprofen, drinks a pint or two of water, and retires to bed. When its my turn. I am enjoying my soak when through the wall comes the unmistakable splash followed by groans of ecstasy as another Coast to Coaster slides into hot water. This has been such a strange day. There’s been so much of it, and we have totally lost track of time. How did that all fit in to one day?? And how did we have time to go out to eat later?? It doesn’t make sense to me now at all, but I know we did. The sunstroke victim rallied, and we were about to go into the empty Shap chippy, where three eager assistants looked up, pleased at the prospect of some custom at last, when we were hailed from the Bulls Head by the U3Aers, who were just ordering their meal there. Of course we joined them. The deserted chippy attracted no custom, until they were closing and a group of teenagers descended. For a split second it looked as though the chippy in chief would turn them away. Damn you. We’d rather throw the chips away than serve you 2 minutes after closing time. But he relented. “There can’t be much for teenagers to do here on a Saturday night,” commented somebody. As for us, somehow we ate a large meal each, enjoyed an evening of good company, and felt OK. We must have been in some sort of timewarp. Once again we awake to a great morning. 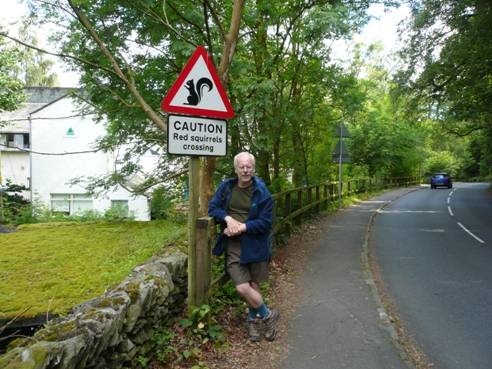 How can this be happening in the Lake District? The view from our B&B window is just as stunning in the morning light. Downstairs the service is attentive, and the ornate chandeliers in the breakfast room a wonderful shade of pink. Nigella’s cookbooks can be seen in the corner. After kitting up we set off for the village. This being such a short stage, we are not in a rush. Time to take the scenic route to the start of the walk. Down to Croft House Bakery, where the shop assistant is sitting outside in the sun, before we disturb him to purchase 2 cheese savoury rolls. It is altogether different in Grasmere this morning. Quiet, early morning dew filled air, a new start, a day full of promise. Instead of going back to the main road we retrace some of our steps from yesterday, and follow the route via Thorney How Youth Hostel, ambling up narrow deserted lanes overgrown with meadow sweet. Eventually, though, we cross a bridge to the main road, and the route proper begins. According to the book we are about to begin “a protracted climb up a bridleway”. 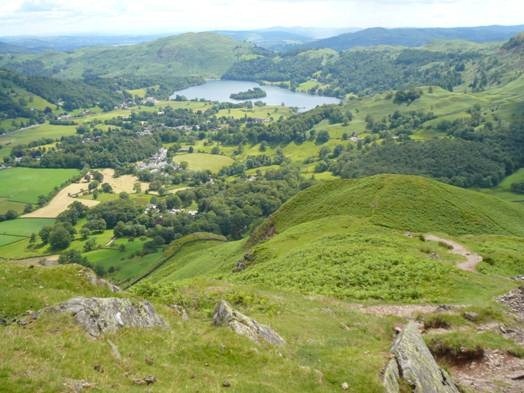 A short distance ahead is a division in the path at which point you can choose the steeper route with views of Grasmere, alongside Little Tongue, or the easier slabbed route up the right side of Little Tongue. My natural inclination is to take the easier route, with a few reservations. But in the event, when we get to the point of choice, the National Trust have closed the bridge over to the right, deeming it to be “unsafe”, so the choice is made for us. I console myself with the thought that Ray would want to do the steep route, and no doubt so would Wainwright!! Just at this point we meet a man who seems to need confirmation that the left hand path is the one. After a brief chat he steams ahead of us, up what soon becomes an ever steepening grassy track. We are quite impressed with this achievement, as we labour steadily behind. 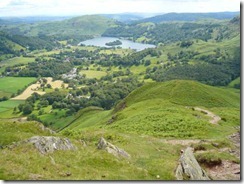 There are views of Grasmere. These may be enjoyed whilst trying to avoid heart attack on the way up. At one stop we catch up the lonely walker. He tells us a sorry tale of how his wife has had to give up because of the state of her feet. She is going into Cotswold in Grasmere today to see what can be done about her boots, and is hoping to rejoin him walking later down the track… He is obviously quite upset about her. We meet them again over the course of many days. The golfers from Kent… John and Trish. Onwards and upwards, over a crag. At the foot of a large area of boulders scattered like giant scree we catch up the U3Aers having their coffee break, and Glynn his cigarette. They tell us how they saw the National Trust sign on the ground by the bridge, and thoughtfully decided to re-erect it before crossing over to the easier path themselves. Oh how we laughed. Luckily we all saw the funny side. All good things must come to an end, and even the 1500ft ascent into the basin of Grisedale Tarn is at last gratefully achieved. The lovely morning has become grey. We can see the famous ‘zigzags’ up Dollywagon Pike towards Helvellyn, and the black Tarn itself, which today looks rather brooding. I have had some kind of strange desire to get here to see the Tarn, and the Brothers Parting Stone, since we came to Ullswater 2 years ago. Or perhaps even before that. 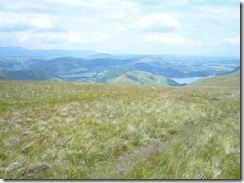 The steep path we have just come up was one of the main ways out of the Lake District by foot, in days gone by. People wanting to get to Penrith would have come this way. Wordsworth would have used it, maybe when he and Dorothy went to Ullswater on the “host of golden daffodils” occasion. 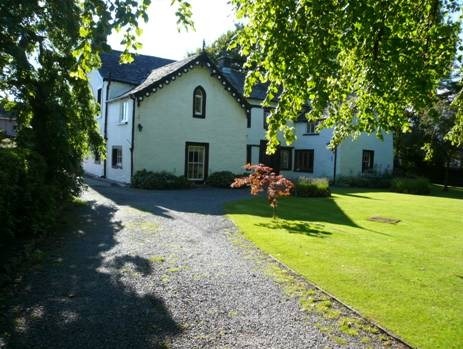 Definitely, when he and Dorothy walked so far from Dove Cottage with his brother John, who was leaving to Captain the East Indiaman ‘Abergavenny’ in September 1800. John was amongst the 300 drowned when the ship sank off Portland in 1805. Dorothy and William returned to the spot, to mark their parting, in June of that year, and William wrote ‘Elegaic Verses in Memory of my Brother’. 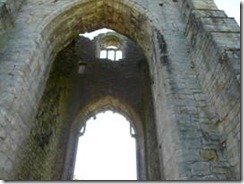 In 1882, Canon Rawnsley formalised the monument here, and had verses from the poem carved onto it. In spite of this, it is not immediately obvious where exactly it is!! It takes Ray some time to locate it down off of the track. It is a large stone, and the carving has become faint with weathering and lichen. Even touch cannot fully decipher the verse. I can just make out .. Here did we stop… and While each… descends. In spite of this I find the whole thing so simply moving. Somehow, emblematic of all partings, in this lonely empty place. We had the family’s early history from the visit to their house in Cockermouth, and it was certainly tinged with sadness and melancholy. We ate our sandwiches there, by the stone, in thoughtful isolation. Ray had wanted to go on up the St Sunday Crag route, and is disappointed that I now feel too tired to go up there. 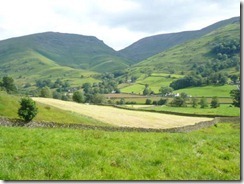 So when we set off down the Grisedale Valley we are fairly silent. It is steep down a rocky path, and the sky is still overcast. After a particularly steep bit there is a new bridge courtesy of the National Trust. 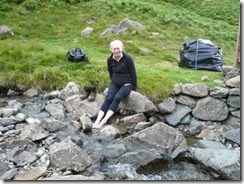 A lovely stream, must be Grisedale Beck. I need a paddle. 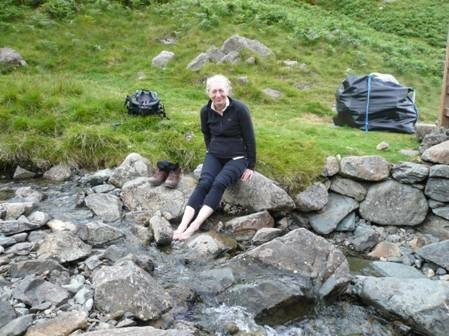 Boots and socks off, the water cold and delightful. Restorative.
. I am still putting my socks back on when two young men stop at the bridge… ON BIKES! They are happy to tell us that they carried the bikes up over Swirrell Edge to the top of Helvellyn in order to cycle down. Mind boggling even if the path was good, but its full of rocks… They aren’t wearing any protective gear either. The confidence of youth. We decide to continue on to Glenridding instead of branching off to Patterdale Village, and the lane comes out just before the first boatyard. As luck would have it there is a tea shack beside the lake, selling scones with Damson Jam. Not to be turned down. Ullswater looks as lovely as it did last time we were here. We can see the lake steamer pier in the near distance. At regular intervals large noisy farm vehicles are transporting quantities of hay or silage along the main road. They must have decided today is the harvest somewhere around here. It’s a fair walk further on along the road to Patterdale, with the obligatory stop at Patterdale Post Office. Not that we want to buy anything. And much further on again to our farmhouse B&B, dodging the traffic where there is no pavement. By the time we turn up the farm track we are definitely ready for a break. 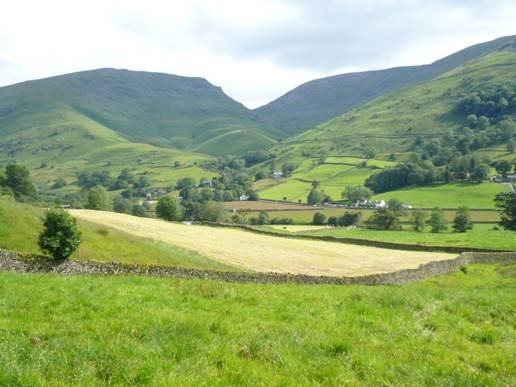 Unfortunately the farm, Greenbank Farm, is not well signed, and what with sheep shearing, and an over enthusiastic shearers dog, we do not spot it on the first pass. Nearby neighbours do not know it – allegedly! But we turn back, and all becomes apparent eventually. We are in the company of three cheerful chaps tonight, two of whom have gone over Striding Edge, one of whom did not enjoy it!! The farmhouse meal is good, but there is one massive disadvantage. NO BEER!!! Today is going to be another of those BIG days, in that in the Lakes there seems to be a major ridge to go over every day. 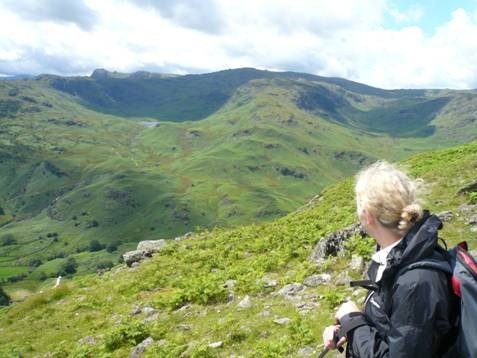 Today we will have to climb out of Borrowdale, cross over the pass at Greenup Edge (one of the ‘let’s get lost’ hotspots of the trip apparently), and descend into Grasmere either on an allegedly ‘easy’ route down the Easedale Valley or via the ‘harder’ ridgewalk to Helm Crag. As to ‘easy’ routes on the walk, I soon realise that one person’s definition of easy is not necessarily another’s. 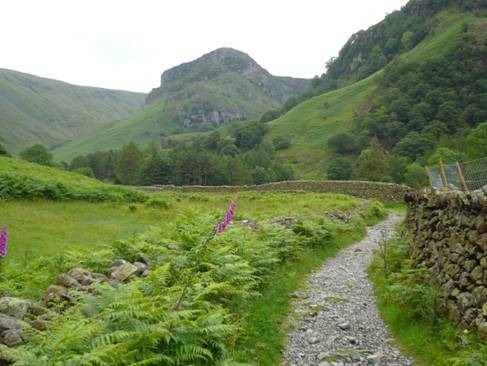 Nevertheless, following a hearty breakfast we are soon off, and progressing up what begins as a gentle and pleasant path under the shadow of Eagle Crag. Yes, we know we will have to get over that escarpment ahead, but hey, this is OK! Lovely morning. Well, a bit grey, but this is still Borrowdale! Its not long before THE BOOK begins to make encouraging remarks such as ‘path gets steeper here’, and breathing gets harder. Must be the altitude. At which point the path becomes steeper again, but the edge of the valley top is so near now. We stagger on upwards, then GREAT, we are over the edge! 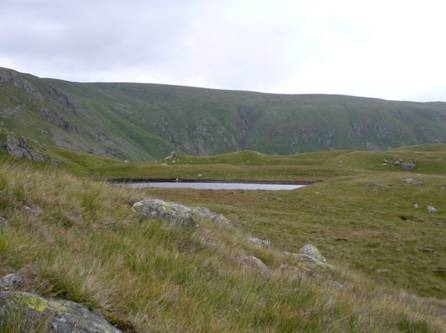 There’s a small tarn, some interesting drumlins and… another great escarpment to get up and over. Best to go straight for it and not think or look too far ahead. We start up. But then. Oo er. There is no path. I am clinging to a wet slippery rockface, rain falling, water rolling down. Where IS the path? Panic. Ray! Where is Ray? I shout, then shout again into space, because there is his rucksack disappearing into the far distance overhead. Jesus. What next? It slowly dawns on me that there must be rocksteps over to the left, and clinging to the rocks like Shelob herself, I manage to get over there. It is still very awkward, but now looks like a possibility rather than an impossible climb. Thus is Lining Crag conquered. Not a place I shall ever feel the need to return to. Ray is fine at the top. “What took you so long?” he enquires. “Chocolate! Now!” Is the uncharitable reply. In some senses the worst is over. However, at the top of Lining Crag begins the “boggy ground” and “indistinct path” where many “lose their way” before topping Greenup Edge. There’s a grey and miserable sky, drizzle, a big bog with paths going here and there. Nowhere is there a likely path to take us down into the next valley. We can see the “prominent fencepost”, but not the “twin cairns” we are supposed to pass between. For the first time, Ray is a bit stumped. The compass is out. The 2 ‘parents’ from yesterday’s family outing are similarly mystified. As is Jenny who also turns up. There are some differing opinions on the general direction. We walk here and there looking for a landmark. Its all looking a bit unlikely, until a fine fellow spots someone descending a long path to a distant Col off to the right. That will do. A wet rocky descent thus begins. A woman in our little group suddenly stops and stands by the path, so we pass by. Later that day it turns out she fell there just in front of us, and broke her wrist. We didn’t see anything. Too busy watching our own feet. Just shows how easy it is to come to harm up here. Anyway, on across another bog, and we come to the dividing of the paths. To the left, the ridge walk to Helm Crag, to the right the path down Easdale Beck to Grasmere. The weather is looking up. Ray and Jenny would like to do the ridge walk. It doesn’t look tooo bad, and I hear myself agreeing to it!? I guess I’ve already had so much excitement today that I have been numbed to fear. Undulating along the lengthy path to Helm Crag we meet day trippers and dog walkers going in the opposite direction. 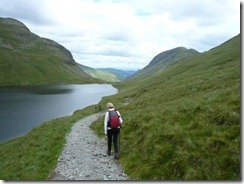 Further on there are great views of Grasmere and Easdale Tarn. 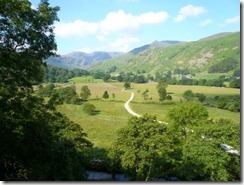 We can also see the path we will be taking en route to Patterdale in the distance. The top of Helm Crag is quite windy. Just as we turn downwards, on a steep exposed corner, 2 fighter jets roar ear splittingly beneath us. My God! We are higher than a ‘plane. Avery queer feeling. Going down is sooo painful. By the time we have got well down towards Grasmere I am in tears. “I won’t be able to walk tomorrow…” Then we meet the woman who has broken her wrist, so I shut up. 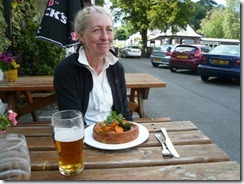 Life takes on a whole new aspect in the centre of the village, with a pint of Hawkshead and a Cumberland sausage in prospect. Post recovery we go on a tour around the village. It is pretty much rocking. Cars, tourists, tourist shops. A Herdy shop. 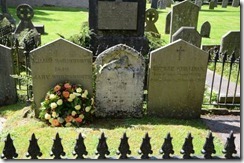 Wordsworth’s grave. 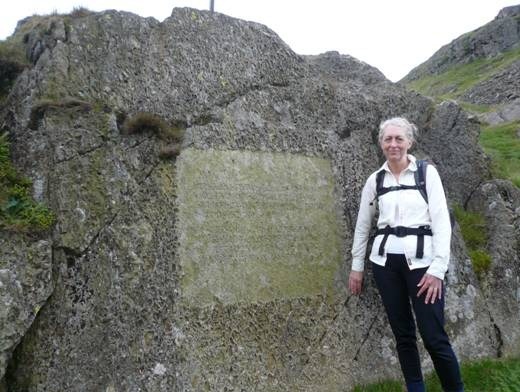 Standing respectfully in front of Mary Wordsworth’s grave, decorated tastefully with a carved sheep, we are rasped out of our reverie by a loud insistent American female voice. There is a pause while her English male companion mentally deals with this. “It’s a sheep,” he answers deadpan. Just then a bus load of Japanese tourists stride into the graveyard towards us, moving as one. Its time to go. 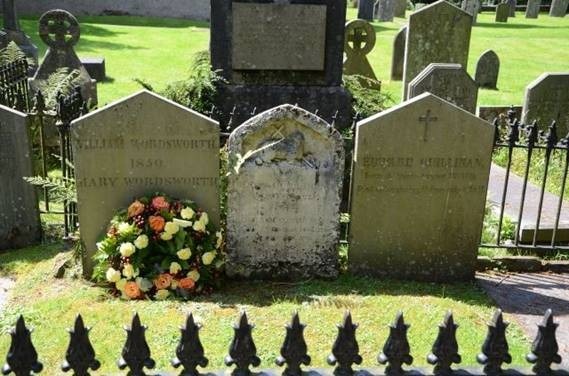 Poor old Wordsworth. “He would’nt mind. He’s dead.” Ray points out, but I can’t help feeling that he would. Our B&B tonight, Chestnut Villa, is a long way out towards the main road. We walk past many other establishments to get there, many with vacancies too. When we do make it though, no complaints. It’s a great place. Three story house, stylishly furnished by its friendly and helpful gay owners. Our room has a bay window with a fabulous view over the fells, and, that most prized of comforts, a BATH. Nuff said.